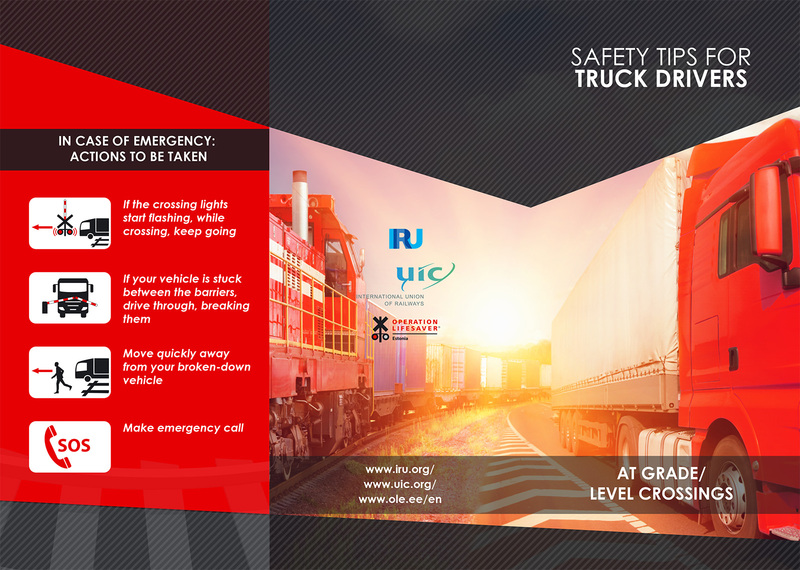 (Geneva/Tallinn/Paris, 3 May 2016) IRU, the International Union of Railways (UIC) and Operation Lifesaver Estonia (OLE) published a Level Crossing Safety flyer on 3 May 2016 to raise awareness of professional drivers and reduce related accidents at this key interface between road and rail infrastructure. This is why IRU and UIC, two worldwide road and rail associations, together with Operation Lifesaver Estonia, have joined forces to raise awareness about level crossing safety amongst transport professionals. While the flyer does not cover every situation that may arise when commercial drivers use a level crossing, it aims to make them more aware of how to avoid risks potentially leading to a collision. Beyond raising driver awareness, this cooperation will also help the three organisations enhance knowledge and safety in the design and use of level crossings. The Level Crossing Safety flyer is currently available in English with other languages set to follow. Based in Paris, the UIC currently groups 200 member railways from all parts of the world. Its main mission consists in promoting the development of rail transport worldwide and organising international cooperation among its members. Main projects focus on technical harmonisation and railway standards, development of freight and passenger business (including high speed), rail transport sustainability, safety and security, and training issues. The UIC maintains close cooperation links with over 50 international and professional organizations. IRU is the world’s road transport organisation, promoting economic growth and prosperity through the sustainable mobility of people and goods. Founded in 1948, IRU works in more than 100 countries. Based in Tallinn, OLE is a non-profit organisation founded in 2004 by the initiative of AS Eesti Raudtee (Estonian Railways) with the mission to increase considerably public awareness about dangers involved in railway traffic and lawful behaviour on railway, with the purpose to reduce the number of railway incidents and people killed and injured in such accidents. OLE’s members are AS Eesti Raudtee, AS EVR Cargo, Edelaraudtee Infrastruktuuri AS and AS GoRail.